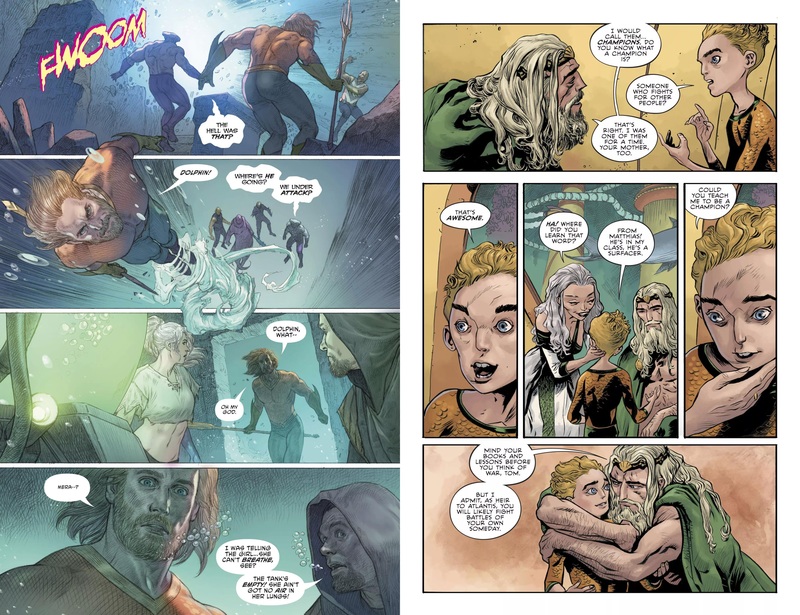 Dan Abnett’s been building some story in Aquaman, and despite the proactive title, the three chapters he writes are more a staging post toward the finale in Kingslayer. Aquaman is in Atlantis, but Corum Rath now rules, having invoked some ancient magic, part of which has been to construct an impenetrable dome around the city. 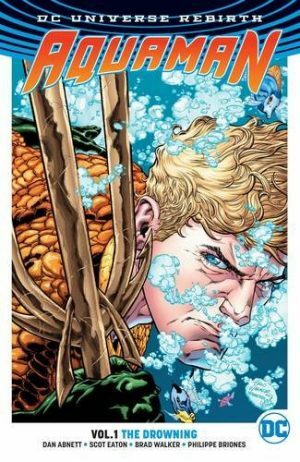 From the start of his run Abnett has infused Aquaman with politics. To begin with it was the politics of government, and now it’s the politics of revolution. 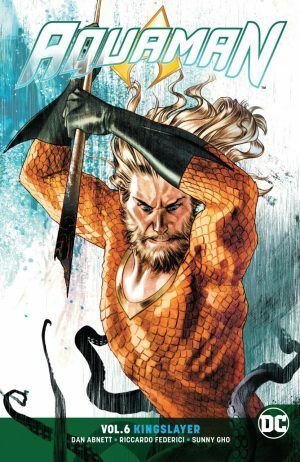 Aquaman considers himself in control, able to see off those who would whisper in his ears, encouraging him to action, but assorted parties interested in specific outcomes are far more experienced in ensuring their way. An interesting aspect is Abnett incorporating the medieval idea of arranged unions, positions and acceptance of duty as a means of political stability. 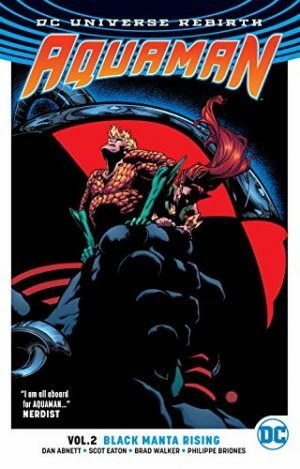 It leads to a fine ethical and emotional dilemma, a very clever piece of scripting, but so much of Abnett’s Aquaman is. Stjepan Šejić’s work on Underworld was so spectacular it might be thought he was irreplaceable, but this series has thrived on artistic change. Riccado Federici brings a fine line, defining his characters with a classical look, and treating Atlantis as if ancient Greece, echoing the recognition of the heroic within us all. If the emphasis placed on the political content suggests a dry read, that’s definitively not the case. Abnett redefines an old villain to good effect, and the entire purpose of the discussions is to prompt the rebels into a massive symbolic gesture. 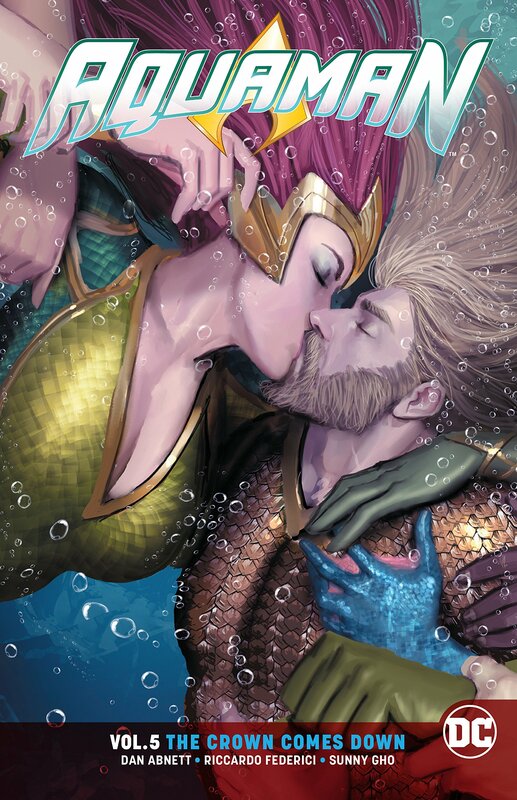 Along the way a surprising conclusion is reached, the groundwork is laid for launching Mera in her own graphic novel, and the tension is cranked up greatly. Completing the book is ‘Crownspire’, a decidedly strange story that toys with perception. 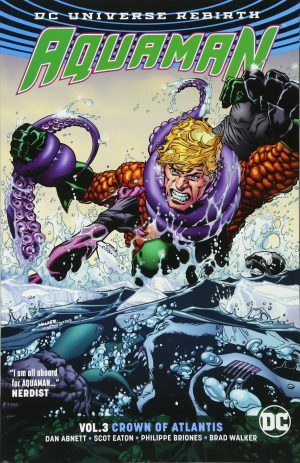 It occus earlier in the continuity of this Aquaman series, at a time when Aquaman and Mera were king and queen of Atlantis. Phillip Kennedy Johnson sets an odd tone from the start, and for quite some while everything is very ordinary, and would be stultifyingly so were it not for Max Fiumara’s art, which is weirdly angled, with strange viewpoints and oddly distorted figures. It’s all deliberate and stylistically consistent, and once the purpose is revealed, it serves Johnson’s plot very well. The revelation is in one sense a superhero comic cliché, but Johnson’s structured events to ensure it pays off, making good use of emotional loss. Perhaps too clever for its own good, keep reading, don’t give up.